First time i got introduced to this healthy sweet beetroot recipe in Pune’s naturopathy center, they have made beet root laddos from this halva and it was really yummy. When I come back home I was pretty sure that I m going to make it. Beetroot is not a costly vegetable and it has lots of health benefits. Most of women are anemic and at the time of pregnancy the hemoglobin level goes down, it’s not beetroots color that make red blood cells! !But beetroot contains lot of iron which helps in the formation of hemoglobin. Beetroot also keeps diabetes under check, reduces bad cholesterol & good for brain. 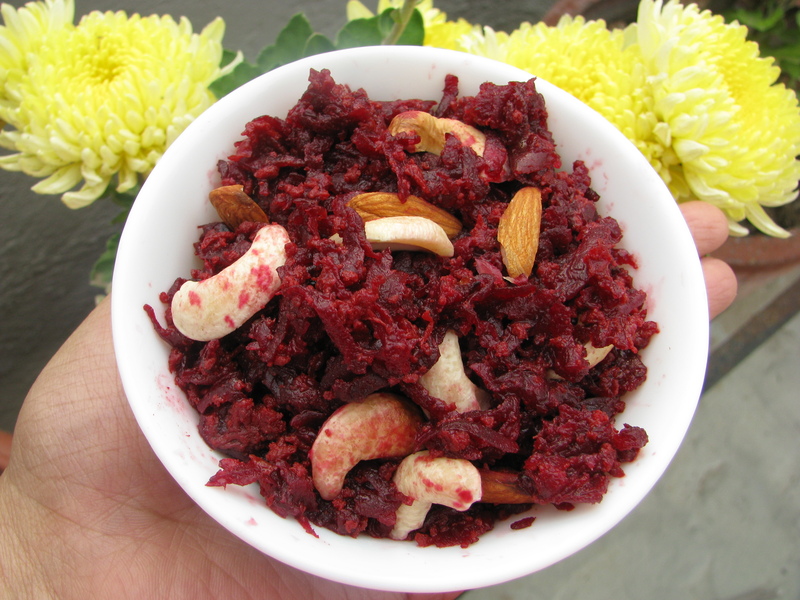 And add badam oil or canola in place of ghee for roasting grated beetroot to make vegan beetroot ka halwa. Heat 1 tablespoon of ghee in a big kadhai /pan and put grated beetroot in it and sauté it on high flame for 5 minutes. Add 1 liter of whole milk / 1/2 liter almond milk in the beetroot and cook it on high flame stirring it occasionally, this will take around ½ an hour for the mixture to become thick. Make the cardamom seed powder in mortar and pestle . Now add sugar or sugar free in beetroot halwa and cook it until it becomes little dry and ghee separates from mixture remove it from flame and add cardamom powder , cashew nuts and raisins to it . 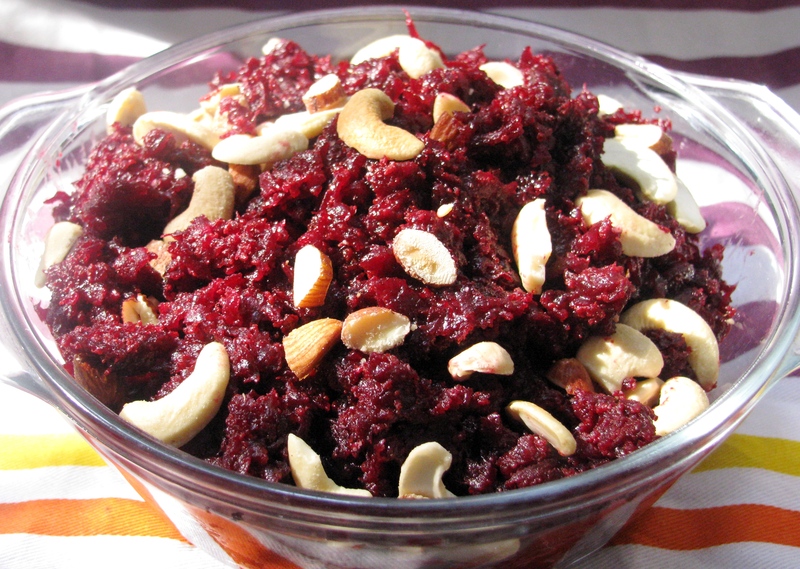 Serve this beet root halwa chilled or hot .